Decorating Suggestion: Set the Table! Decorating Suggestion: Decorate the Chairs with Streamers! Any type of Bread or Rolls would work well for this symbol. We’ve decided to make the Lamb of God Rolls from Catholic Cuisine. 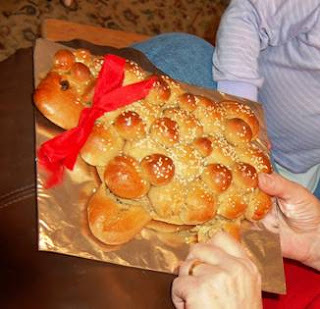 Guest author Lara says, “This Lamb of God can be made with any suitable (read: yeast) dough. If you’d rather not make your own dough, frozen bread dough will work just fine. 1. Divide dough into 4 equal portions. Cover three portions and set aside. 2. On a lightly greased surface, roll remaining dough into a 9x6" oval about 1/4" thick. Cut body of lamb. Transfer to a greased baking sheet (I add a generous drop of lecithin to my oil and rub onto a cookie sheet) Cover and set trimmings aside. 3. Roll one portion of dough into a 9x1" rope. Cut off a 5" section for the head. Cut a scant 1/2" section for tail. Cut remaining rope into two equal portions for legs. Shape head into oval. Attach to body, overlapping slightly and pinching to seal. Shape and smooth nose area. Flatten top of head slightly. Shape tail and attach to body, pinching to seal. Roll each leg section into a 2 1/2" length. Insert under body, pinching to seal. 4. Using most of the remaining dough, make 26 1" balls. Arrange over main part of body to within 1/4" of outer edge. Make a 1/2" ball and shape into an ear; attach to head. Make several 1/4" to 1/2" balls from all remaining dough. Arrange smaller balls atop head and between the larger balls on the body. Cover and let rise 15-20 minutes. (Dough will continue to rise during baking). 6. Bake in a preheated 375 F oven for 10 minutes. Quickly brush with glaze; re-cut legs if needed. Sprinkle body with remaining sesame seeds. Bake 15-20 minutes longer or until lightly browned and bread sounds hollow when tapped in the thickest portion (I actually think this makes bread that is too dry and overdone; I prefer to use a meat thermometer. Bread is done when the center of the thickest part registers 190 F). About halfway through baking, cover browned areas with foil if necessary. Remove from oven and let cool 5 minutes before transferring to a wire rack. 7. Tie ribbon with bell around neck. 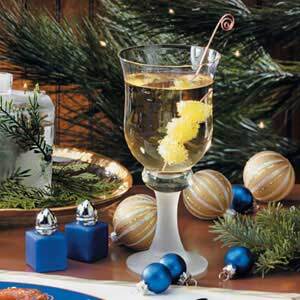 The bubbles from the lemon-lime soda cling to the grape "ice cubes", giving this refreshing beverage lots of sparkle. In a pitcher, combine grape juice and soda. Pour into chilled glasses. Thread grapes on skewers; add to each glass. Yield: 7 servings. We thought this would be a good way to help finish off all of that lingering Easter candy! 1. Assemble sundae bar starting with sundae glasses or bowls, followed by ice cream, fruit, assorted Easter candies, syrups and whipped cream. 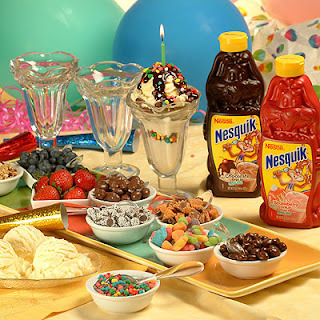 Decorate sundae bar with decorations if desired. 2. Allow children to create their own sundaes using their own imagination. We thought that some Honey Butter would represent the “Pot of Honey” very well and go perfectly with the Lamb of God rolls. To simplify this even further, you could purchase some pre-made Honey Butter or Creamed Honey. 1. Cut the butter into chunks using the dough scraper. 2. Place butter into a bowl and beat on low speed, using a whisk attachment to loosen the butter. Increase the speed to medium and add the honey, cinnamon, and vanilla extract and beat until well combined, about 5 to 7 minutes. 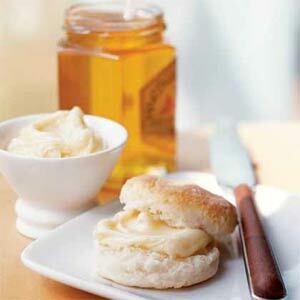 Remove butter from bowl and spoon onto parchment paper or plastic wrap. Roll into a log and refrigerate for 2 hours. Any type of fruit or your favorite families favorite fruit salad would be perfect for this menu item. Here is a recipe from Catholic Cuisine for a Twelve Fruit Salad in honor of the twelve fruits of the Holy Ghost. 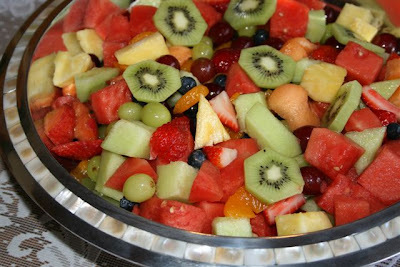 Fruit for Fruit Salad – Strawberries, Blueberries, Red Grapes, Green Grapes, Kiwi, Pineapple, Mandarin Oranges, Watermelon, Cantaloupe, Honeydew, Peaches, Apples, etc. 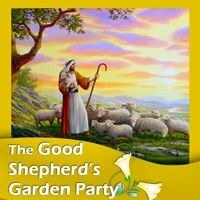 A Mr. Linky will be posted at Catholic Cuisine on Monday April 19th, for anyone who would like to share the pictures from your own Good Shepherd’s Garden Party! I hope your having a great morning so far. All the food looks great,especially the fruit salad. I linked to this one on my roundup too - what a blessing you are to the rest of us to share all this! FYI your document download does not work properly. "Sorry! This document is not publicly available. You will not be able to read it unless the owner changes it to public on their "My Documents" page, or sends you a direct link." Apparently Scrib just made some changes to their site, and now all private documents must be made public in order to be shared, downloaded and printed. We just changed all the Garden Party documents to public so you should be able to download and print now.